The underwriting performance in the U.S. directors and officers (D&O) liability insurance market deteriorated significantly in 2017. Competitive pricing and an increasing number of lawsuits have hurt the line’s profitability, according to a new A.M. Best special report. A.M Best’s Special Report, titled, “Quick Look: D&O 2017 Year-End Results,” states that the main driver of the worsening claims frequency trend is the increase in federal securities class action litigation, as filings in 2017 increased year over year by a reported 52 percent. Although the average size of settlements declined to $18.2 million from $72.0 million in 2016, the negative effects of increased litigation will continue to outweigh the positive effects of decreasing average settlements for most insurers. In addition, while year-over-year direct premiums written in the D&O sector remained relatively flat, the 2017 direct loss and defense and cost containment (DCC) ratio rose to 77.2 from 65.6. The 11.6 point deterioration is the largest experienced since the D&O supplement was first filed in 2011. 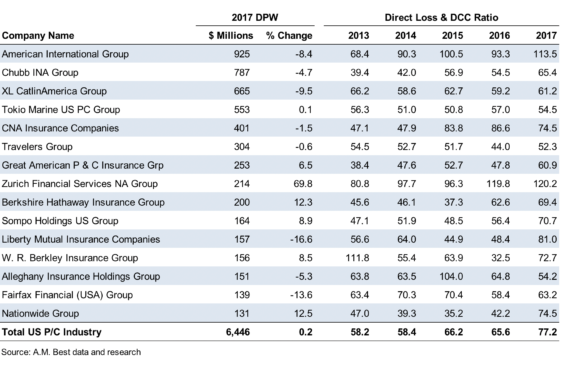 According to A.M. Best, 12 of the top 15 D&O insurers reported increases in 2017 year-end direct loss and DCC ratios. “W.R. Berkley, Liberty Mutual, and Nationwide reported the largest increases in their direct loss and DCC ratios; CNA, Alleghany, and Tokio Marine reported declines,” the report said. AIG, Chubb, and XL Catlin remained the leaders by market share, but each had year-over-year decreases in direct premium written. A.M. Best said that some companies have been showing underwriting discipline and are seeking rate increases. However, pricing remains soft compared with claims trends, and loss and DCC ratios will remain heightened while competitors continue looking to bump up their market share. “Overall, the market share of the top 15 declined 1.6 percent, with their direct premium written down 1.8 percent compared to a total industry direct premium written increase of 0.2 percent,” the report said. “Companies that are focused on underwriting and pricing discipline are reportedly walking away from accounts if they are unable to get their desired rate increases,” the report said. “As long as competition prevents companies from implementing meaningful rate increases, profitability for D&O will continue to decline,” the report concluded.